I was watching a documentary that showed how a Lioness hunted the buffalo. When a lioness is on the lookout, they instinctively set their eyes on the weakest buffalo in the herd. They wait patiently for the opportune time to start the attack. Before the attack, I saw the lioness wait patiently “studying” its target. It was probably observing the behaviour of this buffalo and how good it is on keeping guard of the predators. What was interesting to notice was the lioness always tried to separate the target buffalo from it’s herd. 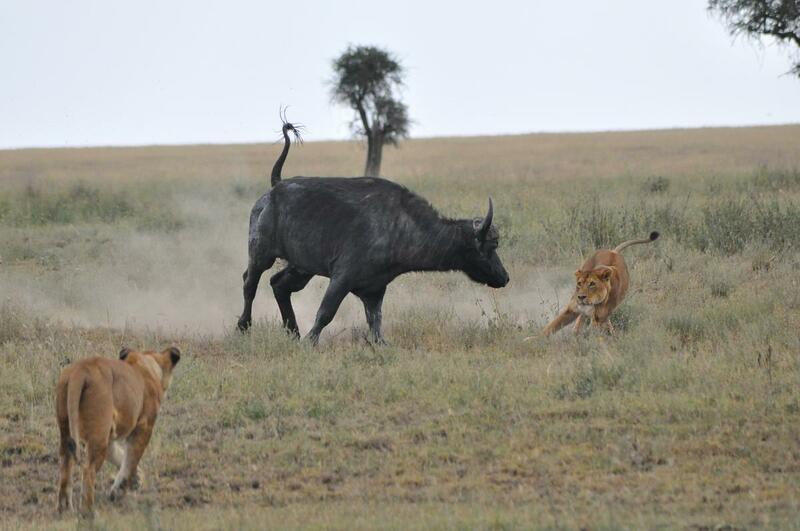 The lioness knew very well if this weak buffalo has the support of its herd, they would defend her at all cost. Within this herd, there are stronger buffaloes that come out to face the enemy when under attack whilst guarding their young by surrounding them. They form this boundary to make sure the predator doesn’t get to them. But when the buffalo gets separated, it’s an easy target. The whole pack can jump in and have a satisfying meal. This is so similar to our walk with God. The Bible tells us that Satan is roaming around in this world like a roaring lion looking for someone to devour (1 Peter 5:8). If we are not watchful, we will surely be separated from the herd and its protection. Consider the herd as the family of God. You can think of the stronger buffaloes as the support crew in your life. They are out there making sure you don’t get hurt and they put their lives on the line to protect you. These could your pastors, counsellors, parents, family and so on. But the minute you get separated from this support crew and your family of God, you are an easy target. You are out in the open without cover. You won’t last long. It will be only the matter of time before Satan gets to you and makes your life a living hell. My point is, sometimes you might not feel like going into the presence of God. Perhaps, you are feeling guilty and you just don’t feel like going to church or attending a church meeting. But these are the very times you need to be there. We all have sinned and we are not perfect people. We will never be “righteous” by ourselves or our deeds. It is God’s righteousness that he accredits to us. When we go to God, He sees us covered in His son’s blood. He doesn’t see us and what we’ve done in the past. He sees His son in us and What His son did on the cross for us. I am not saying people who attend every single church service are ‘super-spiritual’ blameless saints and prophets. They are not. The reason why I “try” to attend all the church meetings is because I don’t want to be separated from the herd. Satan is so cunning in the sense that he slowly gets us to where he wants us to be. He is very patient “studying” his subjects carefully before making a move. Did you ever notice that when you constantly fall into the same sin, you are no longer as convicted as you once were? You just no longer feel as guilty as the first time you’ve done it. This is how Satan works. Slowly but surely he will get to us. At this stage in your walk with God, you might say I am never going to leave the church. I love God and I need Him in my life. But slowly as the months/years go by and after slow and gradual separation from the church, you will be at a stage where you will say, “Maybe this church thing isn’t for me. I don’t feel like God is real to me anymore”. I have seen this happen in so many peoples’ lives. Slowly but surely, Satan managed to separate them from the herd and their lives have turned upside down. I urge you to make every effort to stay close to God and to keep close to the family of God. The people who once were great warriors for God now hate to talk about Jesus or the church. They are no longer walking with God and it is a very sad thing to see. Some of these people have gone on to become “big shots” and successful in life but what good is that? It reminds me of that verse where it says, what does it profit a man if he gains the whole world but loses his own soul. Please be watchful and keep looking at Jesus the author and the finisher of our faith.